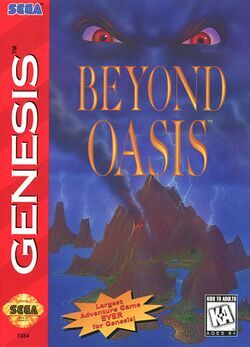 Beyond Oasis (The Story of Thor and The Story of Thor: A Successor of The Light in Europe and Japan, respectively) is an action-adventure released for the Sega Genesis in 1994. It combines the perspective and mechanics of games such as The Legend of Zelda with moves and combos similar to beat 'em ups. The game was followed by a prequel, released in 1996 for the Sega Saturn, titled Legend of Oasis. Beyond Oasis was included in the 2009 compilation titled Sonic's Ultimate Genesis Collection, which included one achievement, the ability to save the game anywhere, the ability to enable rapid fire, and button mappings for the item menu, weapon menu, and map. The player takes the role of Prince Ali, who has discovered a buried gold armlet that once belonged to a wizard who waged a long war against the evil wielder of a silver armlet. The silver armlet was used to create chaos and destruction, while the gold armlet had the power to summon spirits. Ali travels the land of Oasis, gradually acquiring the ability to summon all these spirits, in an attempt to stop the person who has recently discovered the ancient silver armlet and is once again using it for evil. This page was last edited on 17 January 2018, at 09:20.